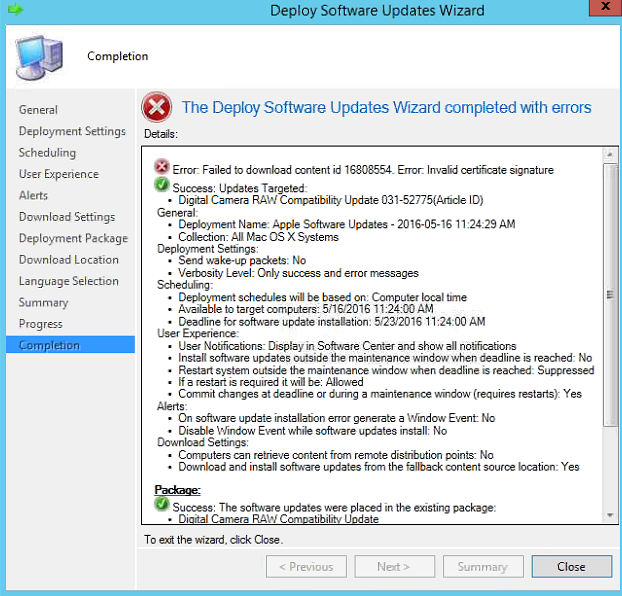 I am unable to distribute Apple updates getting an error: The Deploy Software Updates Wizard completed with errors. Error: Failed to download content id 16808554. Error: Invalid certificate signature. Trying to connect to the root\SMS namespace on the <SCCM> machine. Trying to connect to the \<SCCM>\root\sms\site_<site_code> namespace on the <SCCM>. WSUS certificate is not imported om SCCM server. copy this certificate on the SCCM SMS Provider server. in the Certificates snap-in select Trusted Publishers > right-click Certificates > All Tasks > Import and import the certificate.